1 pc. 3,10 EUR ea. from 3 pcs. 2,71 EUR ea. from 10 pcs. 2,37 EUR ea. from 20 pcs. 2,20 EUR ea. from 40 pcs. 2,05 EUR ea. Ask for a rebate from 300 pcs. 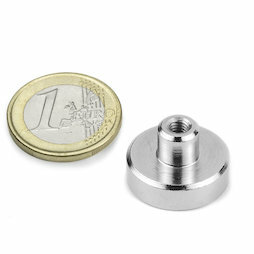 These neodymium pot magnets have a screw socket into which you can screw hooks, eyelets, etc. We also carry identical hook magnets as well as eyelet magnets. 1 pc. 4,71 EUR ea. 1 pc. 3,45 EUR ea. 1 pc. 3,50 EUR ea. 1 pc. 3,66 EUR ea. 1 pc. 3,71 EUR ea. 10 pcs. 0,30 EUR ea. 10 pcs. 1,43 EUR ea. 10 pcs. 0,33 EUR ea. 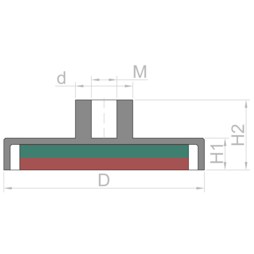 Example: At a 1 mm distance between magnet and steel plate the maximum adhesive force is still around 2 kg.